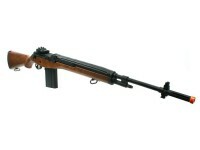 The M14 rifle firearm is based off the very successful M1 Garand which was used in WWII. Even with the success of the M1 Garand, it had its flaws, thus the M14 was born. 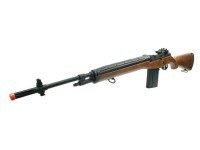 Using the 7.62 (.308) round, and the ability of automatic fire, the M14 was a champion design. Used primarily in the Vietnam war. 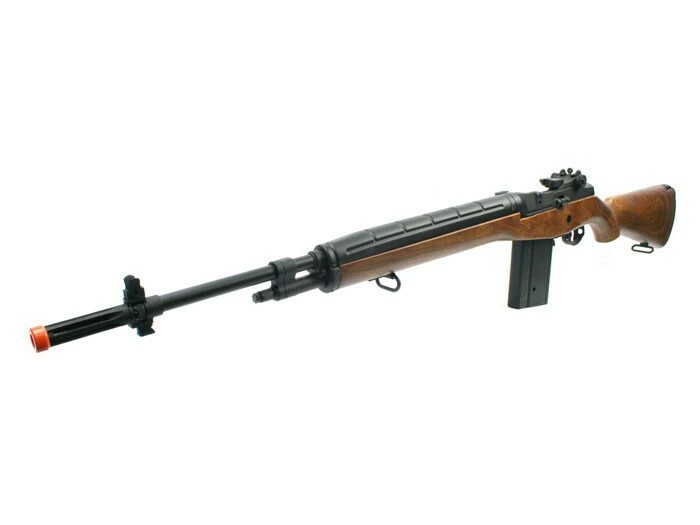 Although the M14 was phased out as the standard-issue rifle in the sixties by the M16, the M14 has fought back in many modern military units. The wood-grained plastic stock is very realistic. Things I would have changed: i think they should include a real m14 sling,Mabey a scope mount option? The top cover, over the barrel, WAS some type of heavy plastic or composite: not metal. Things I liked: Metal, accuracy, RPM, and 450rd mag. Things I would have changed: bigger battery compartment. What others should know: I recommend getting a butterfly Intellect 9.6v 2000mAh NiMH Battery with Large connector and smart charger, it fits well in the battery compartment. Things I liked: Sturdy, realistic, accurate, this gun Is very realistic! This gun is the perfect light weight sniper. Things I would have changed: The bolt is very nice, but when I pull it back it tends to get caught just the smallest bit. Also, while writing this review I can't think of anything else wrong with the gun!! Would it be possible to put different furniture on this model? Different stock? Is it possible to mount a scope on this rifle? No, there is no scope mount/rails to do so. Is there a scope mount for this rifle? I'm sure you could find one on another site if you really tried, but on Pyramyd, sadly no.